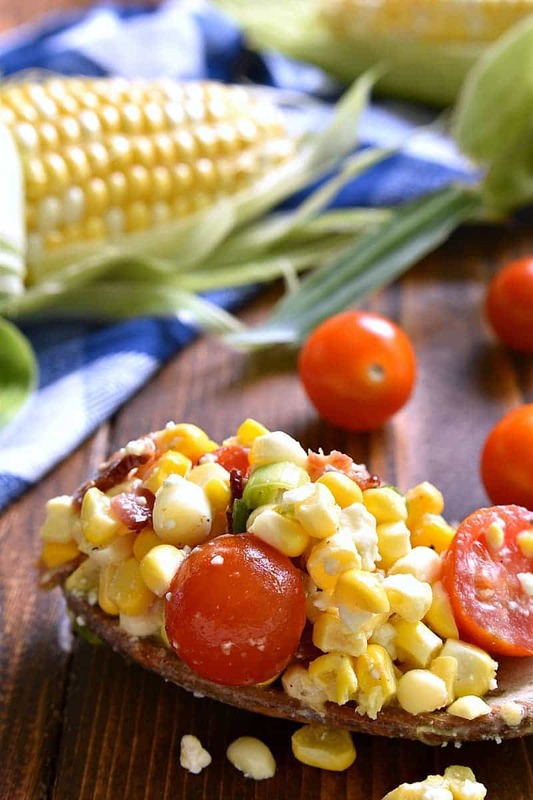 This Bacon Blue Cheese Corn Salad is the most delicious corn salad ever! 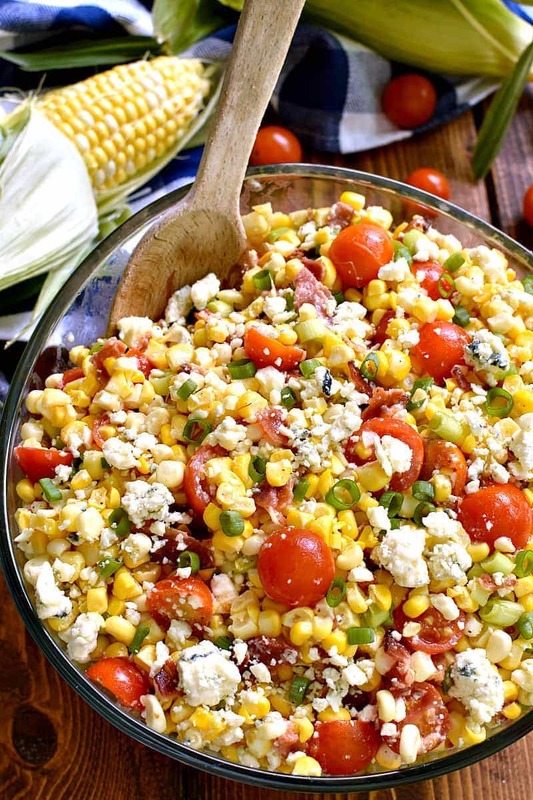 Fresh sweet corn combined with crispy bacon, cherry tomatoes, crumbled blue cheese, green onions, and a light vinaigrette. Perfect for summer picnics, cookouts, or pot lucks! Can you believe that summer is almost half over? Are you living it up? Soaking it in? Doing everything you wanted to do? To be honest, I’m flipping back and forth between feeling like it’s flying by….and wondering if it will ever end!!?? Which, I’m sure, has everything to do with our summer schedule. Yes, our summer schedule is pretty much me being home with the kids or me being in the car….with the kids. In other words, I’m pretty much ALWAYS with the kids, and if I had to guess? That’s the part that has me wondering When. This. Will. End. And the part that feels like it’s flying by? Well, that’s all the summer fun I wish I was having. The good news? There’s still time to turn things around. And have some of the fun that summer was made for! The other good news? I already have a jump start….because I have half-made plans with so many friends. Plans for cookouts and hangouts and nights out…both with and without kids. And if I had to guess, this Bacon Blue Cheese Corn Salad will be part of more than one of them. I LOVE fresh sweet corn in summer, and I couldn’t resist buying way too much of it last time I was at the grocery store. And as soon as I had it in my hands? I knew exactly what I wanted to do with it. There’s something about the sweet crunch of corn that’s the perfect pairing for bacon….and where there’s bacon….there should always be blue cheese. 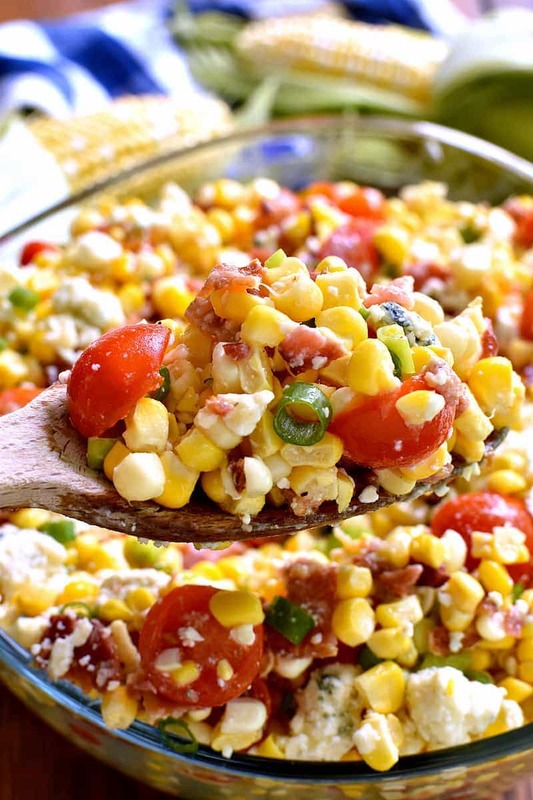 This Bacon Blue Cheese Corn Salad is the perfect side dish for any meal. It travels well, stores well, and gets gobbled up quickly. Ideal for all those second half of summer plans I need to get on my calendar! So friends? If I haven’t seen you in a while, get your taste buds ready for this deliciousness. 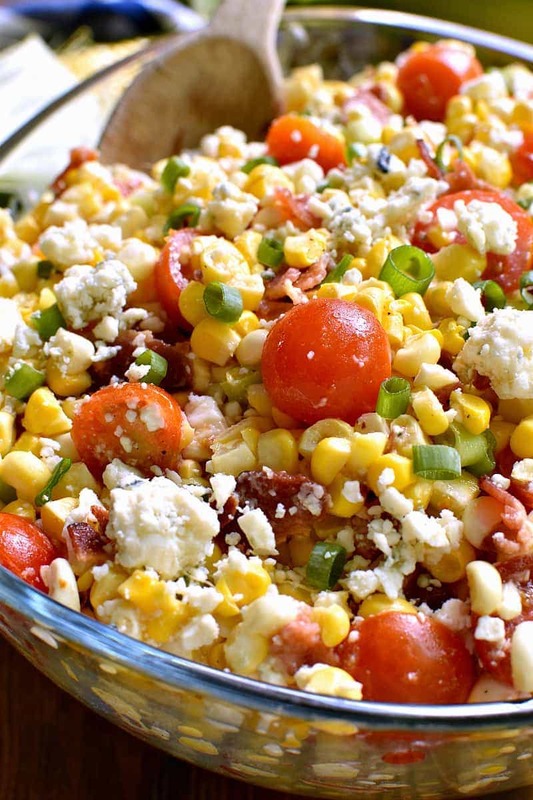 Because I can guarantee there’s some Bacon Blue Cheese Corn Salad in your near future. With wine, of course. Because something needs to get us through the rest of summer break! AmIright? 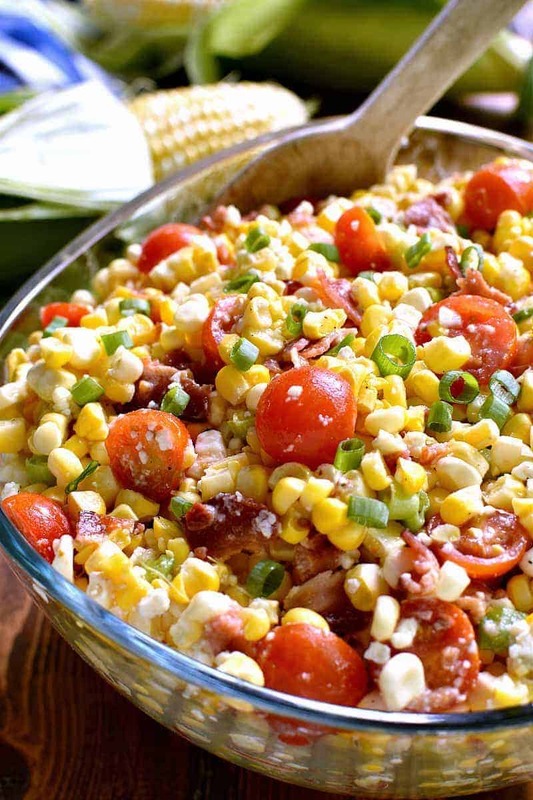 In a large mixing bowl, combine corn, tomatoes, bacon, blue cheese, and green onions. Combine remaining ingredients and whisk well; pour over corn mixture. I can’t wait to try the corn Salad. thank you!!! Hi! Can’t wait to make this salad as it’s written but for now I have a question. I am making it for a picnic that will have children and I’m thinking about changing the type of cheese. Do you have a recommendation? Thank you!!! With kids I might consider fresh mozzarella pearls. Otherwise any kind of shredded or cubed cheese would work! Looks really yummy and would be a good salad to take to cookouts at friends homes or picnics etc. This salad looks so tasty! I know my mom would LOVE this one. THAT is my kind of corn salad, YUMMY! The flavors of this salad is spot on! The bacon and blue cheese combo sounds crazy delicious for a salad! Trying this soon! I don’t think you can ever go wrong with the bacon & bleu combo! 😉 This looks amazing! With my husband and I being both diabetics, it would be helpful if you could post the calories/carbs – nutritional values with your recipes. They all look yummy! I love EVERY ingredient in here! I have to make this! Another FABULOUS recipe – I made this last night and once again, you scored a win! Thanks for sharing! Thanks, Michele! Glad you enjoyed it! This looks so good, I love the bacon and blue cheese combo! This corn salad was delicious, as is. My friends loved it. There’s no denying, though, that it is super rich. I’m on Weight Watchers and the points per serving if you’re serving 10 people are 11 points- very high for a side. I am working on lowering the point value for this and I think I can do it by halfing the bacon and blue cheese and olive oil. You could even add some green pepper and cucumbers for crunch. That brings it down to 5 per serving. As I said, though, if you are not on a diet, this is DELISH the way it is! I’m excited to try this. Is it served warm or cold? I’ve always served it cold. Yes, but I might wait to put the dressing on until the day of. Did you make a day ahead? How did it come out? I have made it a day ahead, but I wait to put the dressing on. Wow!!!! I love corn and ever search recipe for corn, this is looking amazing, ill definitely try this and then tell you the feedback.